Let me start, who enters holiday competition and think that you never win. That is exactly what I thought! 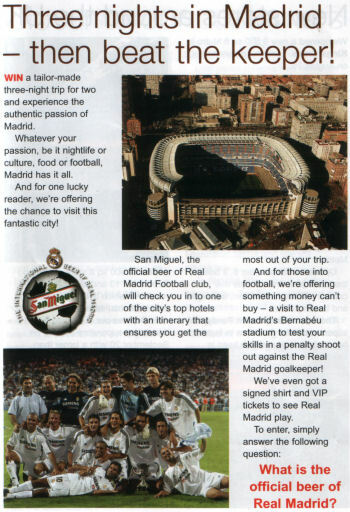 In my workplace, there was a staff only competition for a trip to Madrid for 3 nights includes a football match, a signed shirt and an opportunity for a penalty shootout (which never happened due to problems). I entered the competition on Thursday 21 October 2004 via email, the closing date was on Monday 25 October and I received a phone call on Tuesday 26 October 2004 saying that I won the competition! Here is my diary of events over the 3 days from Friday 18 March 2005 to Monday 21 March 2005. 2 ways in seeing this, by diary or by photos. Click on the photo to go to the page with photos. I apologise in advance for some of the Spanish names and words used there. I cannot always get the accent on the keyboard! Also I do apologise if I make any mistakes here. I will not forget this holiday and what a prize. Cannot really put a value of it. A holiday of a lifetime.